Now, there's a sight for sore eyes! A huge pot legalization billboard has gone up on I-5 outside Seattle. Commuters on the busy I-5 freeway near Seattle will get a daily reminder that an effort to legalize marijuana in Washington state is underway. 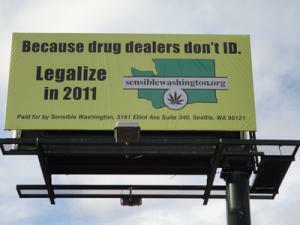 Sensible Washington , the group behind this year's initiative effort that failed to make the ballot, has put up a billboard saying "Because Drug Dealers Don't ID... Legalize in 2011," with the group's web address and a pot leaf superimposed on a state map. Although Sensible Washington's 2010 initiative effort was hampered by criticism and lack of support from key elements of the state's drug reform community, the group is back and is aiming at getting its initiative on the ballot next year. The huge, bright yellow billboard is installed at mile marker 138 in Fife, Washington, between Tacoma and Seattle. The double-sided sign faces both north- and south-bound traffic and will be seen by more than a quarter-million vehicles per day. The billboard will remain up through the November 2011 election. That means commuters passing it twice daily will have seen the message more than 400 times each by Election Day. "Thanks to generous donations from two Sensible Washington volunteers and support and cooperation of the billboard company, Gotcha Covered Media (thank you! ), we now have North- and South-facing billboards at this location through the November 2011 election," the group announced on its web site.